Our father, Camilo D. Gurrola, “Cam” “Miller” was born on July 18, 1925 in the “Campito” in Fillmore California, where he lived the majority of his life, except for the time spent overseas during WWII. 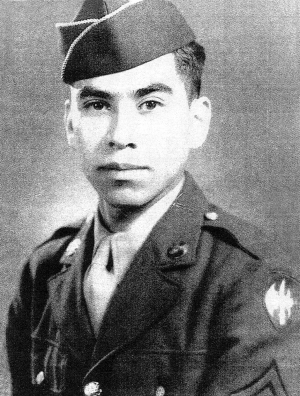 He attended Fillmore schools and when he turned 18, was drafted into the U.S. Army. His 3 brothers, John, Gregg, and Julio Gurrola, followed soon after, defending our country during WWII. He achieved the rank of PFC and on April 11, 1945 with the 104th Infantry Regiment- 26th Infantry division (a.k.a “Yankees”) liberated Dora-Mittelbow concentration camp in Austria (verified by the L.A museum of the Holocaust). The horrors of what he witnessed left a deep, lasting impact for the rest of his life. He was awarded the Bronze Star medal, Purple Heart, Good Conduct medal, and the Victory medal. He enjoyed watching football, his favorite teams being the Rams and Notre Dame, Yankees baseball, watching old westerns and movies about WWII, jig-saw puzzles and spending time with his best friend his German Shepard named Heidi. In 1952, he married our mother, Theresa Vasquez. In 1954, daughter Anna Marie was born, in 1956 Gloria Irene was born, and in 1962, son Lawrence Daniel was born. He worked at the Naval base in Port Hueneme for 30 years, holding various positions. During that time, he took the required college courses to become a real estate salesman. His final year was spent at Greenfield care center due to various health issues. Our eternal gratitude to the many CNA’s, RNA’s, LVN’s, RN’s, and Matthias who treated our father like their own “Papa”. Grandchildren Christy, Naomi Qualls, Daniel and Anthony Mendez, Danielle Gurrola; 9 great-grandchildren; 1 great-great grandson and brother Richard Gurrola. Preceded in death by parents Panfilo and Juana (DeHaro) Gurrola; sisters Katie Zavala, Lucy Munoz, Pauline Ruiz and Candy Gurrola; brothers John, Greg & Dolores (twins) and Julio Gurrola. A special thank you to Dr. Jeffrey Allan and his staff for their care and compassion, also to Companions Hospice. Rosary was held on Thursday, Sept. 20, 2018 9:30am at St. Francis of Assisi Church 1048 Ventura St. Fillmore, Funeral Mass at 10:00am St. Francis of Assisi Church burial followed at Bardsdale Cemetery 1698 S. Sespe St. Fillmore, CA. Memorial donations may be made to VFW or St. Francis of Assisi Church.